I'm huddled in the front room with some shell-shocked friends, watching my city burn. Britain is a tinderbox, and on Friday, somebody lit a match. How the hell did this happen? And what are we going to do now? The BBC is interchanging footage of blazing cars and running street battles in Hackney, of police horses lining up in Lewisham, of roiling infernos that were once shops and houses in Croydon and in Peckham. Last night, Enfield, Walthamstow, Brixton and Wood Green were looted; there have been hundreds of arrests and dozens of serious injuries and it will be a miracle if nobody dies tonight. This is the third consecutive night of rioting in London, and the disorder has now spread to Leeds, Liverpool, Bristol and Birmingham. Politicians and police officers who only hours ago were making stony-faced statements about criminality are now simply begging the young people of Britain's inner cities to go home. In the scramble to comprehend the riots, every single commentator has opened with a ritual condemnation of the violence, as if it were in any doubt that arson, muggings and lootings are ugly occurrences. That much should be obvious to anyone who is watching Croydon burn down on the BBC right now. David Lammy, MP for Tottenham, called the disorder 'mindless, mindless'. Nick Clegg denounced it as 'needless, opportunistic theft and violence'. Speaking from his Tuscan holiday villa, Prime Minister David Cameron – who has finally decided to return home to take charge - declared simply that the social unrest searing through the poorest boroughs in the country was "utterly unacceptable." The violence on the streets is being dismissed as ‘pure criminality,' as the work of a ‘violent minority', as ‘opportunism.' This is madly insufficient. It is no way to talk about viral civil unrest. Angry young people with nothing to do and little to lose are turning on their own communities, and they cannot be stopped, and they know it. Tonight, in one of the greatest cities in the world, society is ripping itself apart. Violence is rarely mindless. The politics of a burning building, a smashed-in shop or a young man shot by police may be obscured even to those who lit the rags or fired the gun, but the politics are there. Unquestionably there is far, far more to these riots than the death of Mark Duggan, whose shooting sparked off the unrest on Saturday, when two police cars were set alight after a five-hour vigil at Tottenham police station. A peaceful protest over the death of a man at police hands, in a community where locals have been given every reason to mistrust the forces of law and order, is one sort of political statement. Raiding shops for technology and trainers that cost ten times as much as the benefits you're no longer entitled to is another. A co-ordinated, viral wave of civil unrest across the poorest boroughs of Britain, with young people coming from across the capital and the country to battle the police, is another. Noone expected this. The so-called leaders who have taken three solid days to return from their foreign holidays to a country in flames did not anticipate this. The people running Britain had absolutely no clue how desperate things had become. They thought that after thirty years of soaring inequality, in the middle of a recession, they could take away the last little things that gave people hope, the benefits, the jobs, the possibility of higher education, the support structures, and nothing would happen. They were wrong. And now my city is burning, and it will continue to burn until we stop the blanket condemnations and blind conjecture and try to understand just what has brought viral civil unrest to Britain. Let me give you a hint: it ain't Twitter. 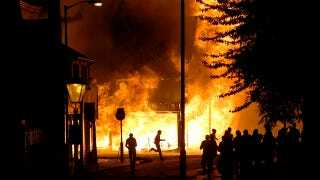 I'm stuck in the house, now, with rioting going on just down the road in Chalk Farm. Ealing and Clapham and Dalston are being trashed. Journalists are being mugged and beaten in the streets, and the riot cops are in retreat where they have appeared at all. Police stations are being set alight all over the country. This morning, as the smoke begins to clear, those of us who can sleep will wake up to a country in chaos. We will wake up to fear, and to racism, and to condemnation on left and right, none of which will stop this happening again, as the prospect of a second stock market clash teeters terrifyingly at the bottom of the news reports. Now is the time when we make our choices. Now is the time when we decide whether to descend into hate, or to put prejudice aside and work together. Now is the time when we decide what sort of country it is that we want to live in. Follow the #riotcleanup hashtag on Twitter. And take care of one another. This post originally appeared on Penny Red. Republished with permission.